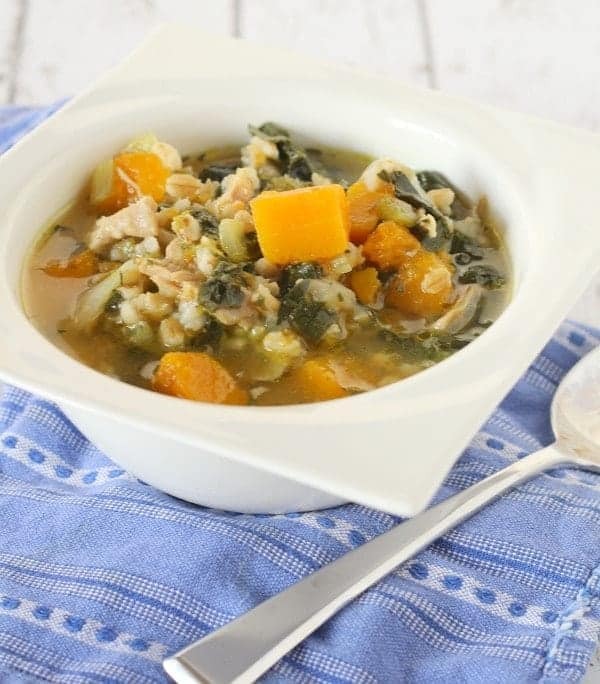 This chicken barley soup could easily pass for comfort food but it is packed with kale and squash so you don’t need to feel guilty about eating it! I mentioned earlier this week that stir-fry is one of my “clean-out the fridge” meals. Well, so is soup. And spaghetti too, for that matter. Apparently I’m always cleaning out my fridge. Not cleaning my fridge (obviously), cleaning out my fridge. Let’s not get confused here. I didn’t menu plan and am scrambling to make a meal. I need to go grocery shopping but I’m putting it off until the weekend so I don’t have to take the kids with me. I had a plan but I’m either a) too lazy exhausted to carry through with it or b) bored with the idea before I even make it. Happens all the time. I’m super duper not good at measuring ingredients and writing down recipes when I make these clean-out-the-fridge-no-recipe-fly-by-the-seat-of-my-pants meals. But this time, I actually wrote down the ingredients and translated my chicken scratches into a Google document and even photographed the recipe (leftovers). You could take this chicken barley soup a step further into easy-land by buying pre-cut squash, pre-washed and cut kale, and a rotisserie chicken from the store. Then all you’ll have to do is de-bone that beast (hate that job!) and throw it all together until that barley is nice and tender. Snuggle up with a bowl of this soup, a blanket and a fire in the fireplace or your favorite show on TV. Who says comfort food has to be unhealthy and laden with fat? Heat oil in a large soup pan (I used a 9 1/2 quart french oven — there was room to spare) over medium heat. Saute the onions and celery (stirring frequently) until onions are softened and translucent (about 7 minutes). Add chicken, kale, squash, broth, water and herbs and stir to combine. Bring to a boil, add barley, stir and reduce to a simmer. Cover and cook for 50 minutes or until barley is tender. Verdict: Loved this soup! Good thing too, because it makes a ton. Husband’s take: He liked this a lot too — maybe even more than I did. Changes I would make: None are necessary but like I said, this is a clean-out-the-fridge meal so if I didn’t have squash, I might throw in sweet potatoes or carrots. If I didn’t have kale, I might throw in chard or spinach. Thanks for reading! 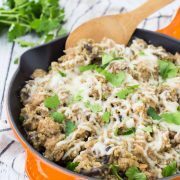 As always, if you love this recipe, make sure to subscribe to my newsletter so you’ll never miss a recipe, or you can always find me on Twitter, Facebook, Google+, Pinterest, and Instagram. 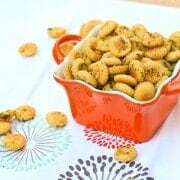 Just the ither day I was wishing to have a homemade version of onion soup mix, and came across your recipe while loking for herbes de provence. I am so thrilled to find your version of both. Thankyou so much. 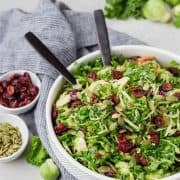 Can this be adapted for crock pot? I think it would work well in the crock pot but I haven’t tested it so I can’t guarantee the results. If you try it, let me know how it turns out! 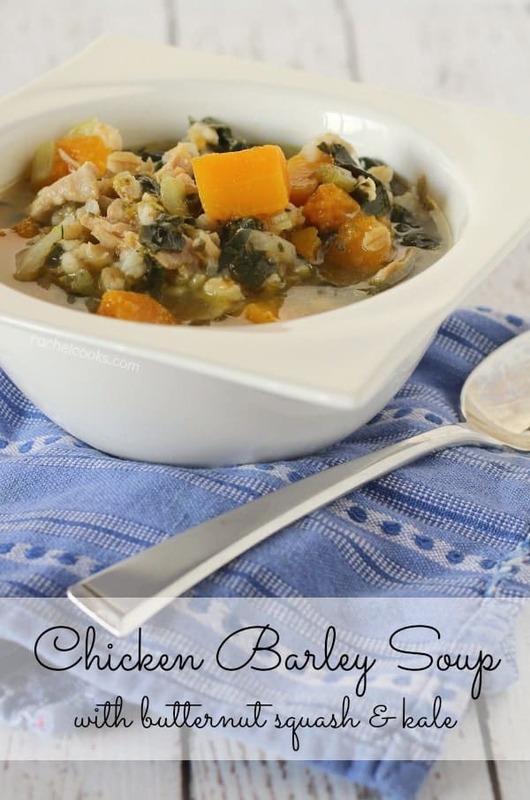 I just made your chicken barley soup with kale and all I can say is DELICIOUS! I ate two bowls and could easily eat another one. This will definitely be one of my favs. Thanks for sharing the recipe. Oh I’m so glad you liked it! Thanks for letting me know — made my day! This just moved way up on my must make for dinner list. My kids will eat just about anything if it has butternut squash in it. I could see myself making this with sweet potatoes because I have those on hand more than I have squash. But yes, a perfect clean out the fridge meal! I’d call it comfort food! 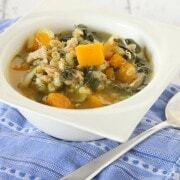 Love the flavours in this; it sounds such a hearty and tasty soup!